Tomas Brolin wasn’t the only excellent midfielder to strut his stuff at the Stadio Tardini in the ‘90’s. I chose Brolin because I wanted to celebrate the highs of his career. A lot of people only remember the podgy Tomas Brolin who shambled his way through spells at Leeds and Crystal Palace, but he was a great player once upon a time and I don’t think that should be forgotten. That said, Parma also fielded a lot of top quality midfielders who made the most of their opportunities and enjoyed lengthy, successful careers. Here are a few of my favourites. Baggio’s period at the Tardini was very successful and he collected two UEFA Cup winners’ medals and one for the Coppa Italia during his time there. 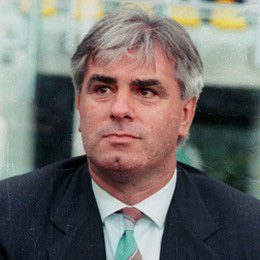 He was a stalwart for Parma during their most successful period, and also won 60 international caps in a 9-year Azzurri career. My first memory of Baggio comes from watching him at USA ’94. A confused 6 year old, I still remember turning to my father and saying “’Dino’? I thought Baggio’s name was ‘Roberto’?”. I’m glad I finally sussed the difference between the two as both were wonderful players in their own right. Read his name again: Massimo Crippa. He just <I>sounds</I> like a hard-man, doesn’t he? Crippa, like Baggio, was a defensive midfielder but his playing style was much more abrasive. Signed from Napoli in 1993, Crippa held Parma’s midfielder together for 5 seasons before departing for Torino at the age of 33. He was a true battler: the kind of player who never gave anything less than 100%. Even when all hope seemed lost and his teammates had surrendered, Crippa puffed his chest and carried on like he could beat the opposition on his own. But Crippa wasn’t just a pure destroyer. Sure he wasn’t quite as classy as Baggio, but Crippa was comfortable with the ball at his feet and was very adept at recycling possession. He was gritty, ferocious and strong in the challenge, but Crippa was no hatchet man and he rarely lost the ball. In addition to winning the UEFA Cup and Super Cup with Parma, Crippa won Serie A, the Supercoppa and a further UEFA Cup with Napoli. 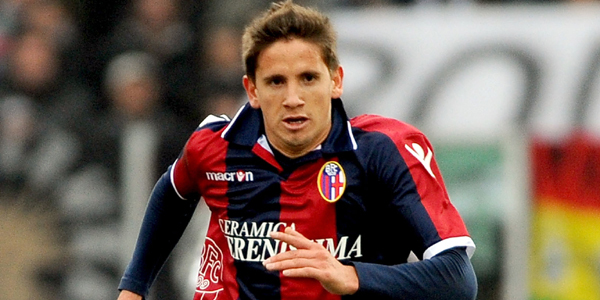 Crippa was capped 17 times by Italy, and finished his career in 2002 after a two-year spell with non-league Canzese. A completely different type of player to Crippa and Baggio, Veron is (was?) one of the classiest playmakers of his generation. Veron only played for Parma for a single season (1998-99) but he helped the Gialloblu scoop two trophies (UEFA Cup & Coppa Italia) that year. Because of the briefness of Veron’s Parma stay it’d be a stretch to call him one of the club’s all-time greats, but this isn’t about that: this is about my favourite Gialloblu players. Veron, like yesterday’s subject (Tomas Brolin), endured a rough stay in England but he was always world-class in Serie A. Equally at home in deep and advanced positions, Veron’s technical quality, vision and passing made him one of calcio’s great creators. He was the heartbeat of the side spraying passes around the field and dictating the game like a metronome. I’m sure Parma would’ve achieved even greater things if they’d been able to keep hold of Veron, but Lazio’s lure was too much for him and he left the Gialloblu in 1999 for approximately £18m. To be fair to Juan Sebastian, the move paid-off: he won Serie A, the Coppa Italia, the Supercoppa and the UEFA Super Cup in two seasons with the Aquile. 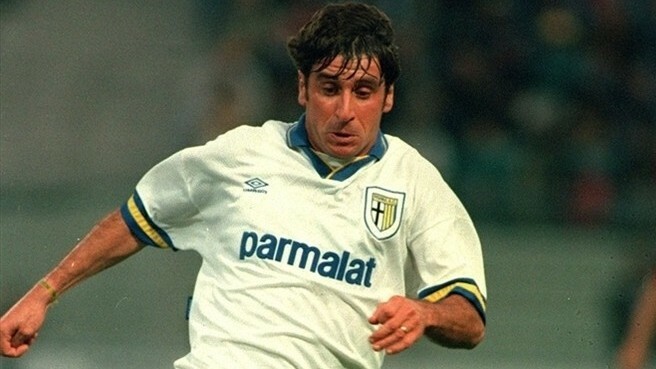 Journeyman Stefano Fiore played for 12 professional clubs before his retirement this year and enjoyed two spells with Parma in the ‘90’s. I remember him and Diego Fuser in Gialloblu shirts crica 1998 with Fiore as playmaking and Fuser occupying the right channel. Alain Boghossian always springs to mind and not just because he has a fantastic surname: the Frenchman was real terrier around the centre circle. Two players that I’m too young to vividly remember but definitely deserve a shout: Gabriele Pin and Marco Osio. I know that Osio in-particularly was hugely popular with the fans, and not just for his impressive Jesus-haircut/beard combo. 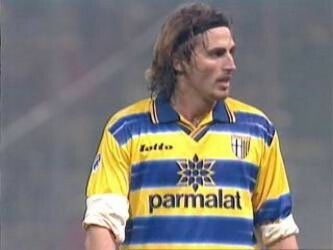 One of Parma’s first real stars during the ’90’s.